Joe Schmidt will remain as Ireland coach until at least June 2017 after signing a one-year contract extension. 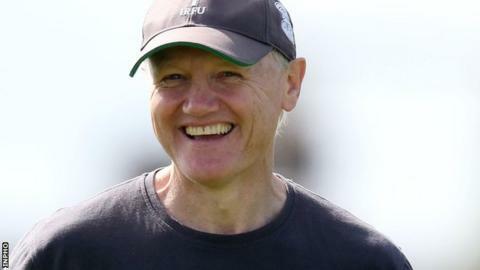 The Irish RFU were keen to retain the services of the 49-year-old after back-to-back Six Nations Championship wins. Ireland would probably have preferred to tie Schmidt into a longer deal, knowing his record with Leinster and Ireland makes him a man in demand. "I am looking forward to the next two challenging years with the national team," said Schmidt. "It has been great to be involved in such a player-driven environment, along with such a skilled and positive staff, to support them in their quest to be as competitive as possible." Schmidt guided Leinster to two Heineken Cup triumphs, two Pro12 titles and a European Challenge Cup success during his three seasons with the province. After taking over from Declan Kidney in the summer of 2013, he led Ireland to the Six Nations Championship during his first 12 months in charge and his team retained that title in 2015 following a successful autumn campaign which included wins over South Africa and Australia. Overall, Ireland have won 16 of the 20 Tests they have played under Schmidt. The announcement of their coach's contract extension came just 17 days before Ireland face an opening World Cup warm-up game against Wales in Cardiff. "We believe that Joe is one of the leading coaches in world rugby, so we are delighted that he has extended his contract and will continue to work in Irish rugby until the end of the 2016/17 season," IRFU performance director David Nucifora said. "Outside of his national team duties, Joe has contributed to the development of indigenous coaches across the provincial and under-age structures, as well as having a positive input into the Ireland Under-20 and women's squads."